Saturday mornings aren’t complete without a steaming plate of light and fluffy scrambled eggs (crispy bacon and buttery toast optional but definitely recommended). But learning how to make scrambled eggs can be tricky. It’s easy for this beloved weekend essential to become a crusty, dry, lifeless lump of overcooked dull yellow eggs. Turns out, the problem might not depend so much on your talents in the kitchen; everything from the type of pan you use to what you add to your eggs could be the reason why you end up with disaster instead of delicious. If you like your eggs cooked in every style, try these 55 delicious ways to have eggs for every meal. 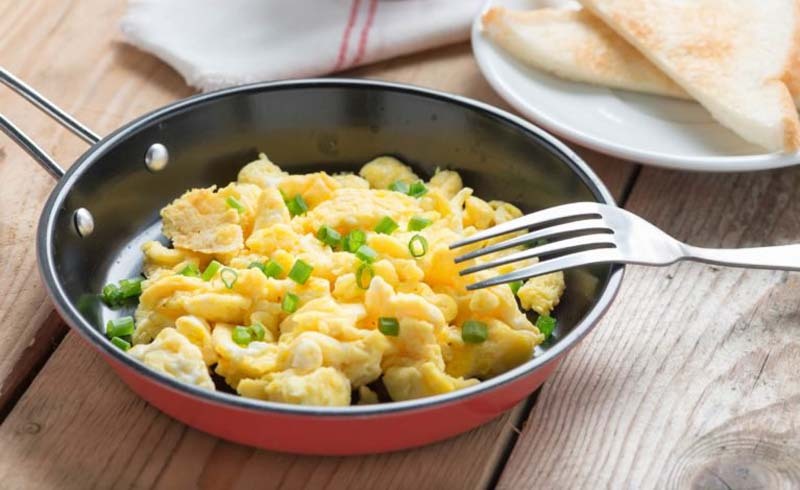 Alex Guarnaschelli, celebrity chef, Food Network star, and executive chef of Butter in New York City, told us exactly how to make scrambled eggs. Whisk the eggs in a bowl with Guarnaschelli’s tried and true recipe: a pinch of salt, cracked black pepper, and a splash of cool water to loosen them up. Place some butter in a pan and let it melt on mellow to medium heat (don’t let it turn brown!) Once the butter is melted in your pan, pour in the eggs. The pan should be hot but not piping hot, since too high heat is what leads to overcooked and dry eggs. When your eggs reach their desired consistency, immediately remove them from the heat and transfer to a plate. If you don’t, you run the risk of ruining that perfect pile you just worked so hard to create. “They will continue to cook as long as they are in the pan, even if you remove it from the direct heat of the stove,” she says. Finally, one last rule before digging in. “I scramble the eggs when I am ready to sit down and eat. 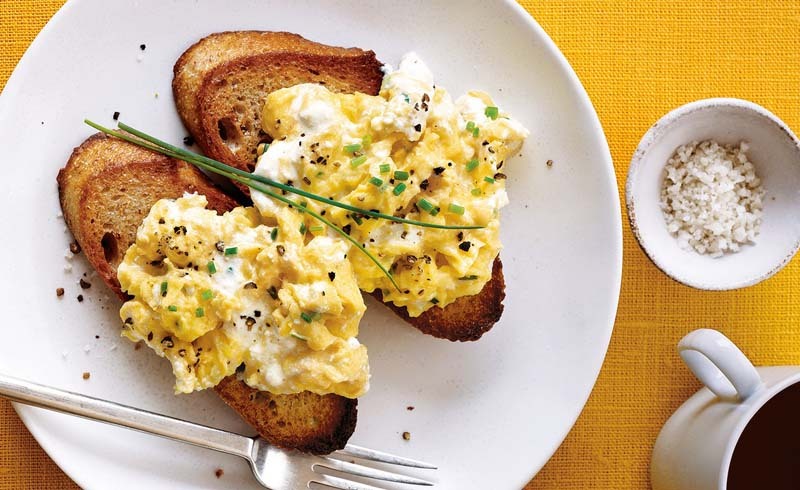 Scrambled eggs are so simple but they don’t wait or taste better cold!” says Guarnaschelli. If you’re using anything other than a nonstick pan, that’s your first mistake. You might love your trusty cast iron but it’s beautiful for cooking just about everything except scrambled eggs. Even with a ton of cooking fat or a well-seasoned pan, there’s something about the cast iron that makes eggs want to stick, meaning you’ll end up with less eggs and a caked on mess to scrub later. “A nonstick pan and some butter is the best combo to make the eggs cook evenly,” says Guarnaschelli. If you only have cast iron in your cabinet and want to make perfect scrambled eggs, order this nonstick pan with over 1,500 perfect reviews. Don’t make the mistake of adding milk or cream, no matter how creamy you like your eggs. “To make fluffy scrambled eggs, the best trick is to whisk in a splash of water and nothing else. Cream, milk, and other liquids drag the eggs down!” she says. If you want extra fluffy scrambled eggs, try adding this secret ingredient. If you crave a little more flavor, take a page out of her mother’s book (she happens to be an esteemed cookbook editor) and whisk in a couple of drops of hot sauce and Worcestershire sauce. “It’s the perfect combo to elevate the egg flavor slightly without overpowering,” says Guarnaschelli. “I love freshly grated Parmesan cheese, too.” Now that you know how to make scrambled eggs like the pros, learn these other cooking tricks that are only taught in culinary schools.